Resources for current PhD students are provided via the University VLE Moodle. Information about enrolling on Moodle is circulated to students when they join the Faculty. 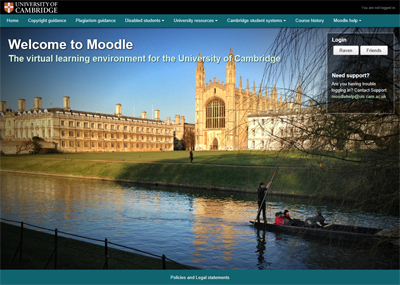 If you have any problems or queries about Moodle please contact the Faculty's Moodle Coordinator Daniel Bates (db298@cam.ac.uk), or for more general issues, the PhD Coordinator Alison Hirst (ash26@cam.ac.uk).